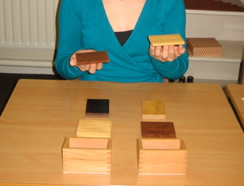 - Three sets of six wooden tablets, each polished or varnished. Each set is a different wood, color, and weight. Invite the child to come and work with you. Tell the child that before we begin working, we need to wash our hands and sensitize our fingertips. Both you and the child do so. Then bring the child over to the shelf and show him the first two boxes (the lightest and heaviest) with the baric tablets. Give the child the name of the material and then have him bring over one box at a time to the table. Have him place both boxes next to each other and in the upper middle of the table. Then have the child sit to your left. - Take out two of each tablet and place them in two separate piles (based on their weight) in front of their respective boxes. - Show the child how to hold one of the baric tablets on the tip of your fingers. - Pick up the other tablet and hold it on your other fingertips. - Close your eyes and feel the pressure of each. - Have the child feel the pressure of the two tablets by placing them for him on his fingertips. - Ask the child if they feel different. - If the child says that they feel the same, come back to the Baric Tablets another day. - If the child says they feel different, then continue with the presentation. light tablets to show the child that they feel the same. - Take out all of the tablets and mix them up into two different but equal piles. tablets that look like in one pile in front of you on the right (point to spot). you will put in a pile in front of you to the left (point to the spot). - Close your eyes and hold in each hand the top tablet of each pile. - Repeat to feel for next match. - Repeat until both piles have been sorted out correctly into their respective piles for weight. - Mix the tablets again and allow the child to work with the tablets as shown. The child works individually with the light and heavy tablets as shown during the presentation. The child works with the heavy and medium tablets in the same manner as in the first presentation. The child works with the light and medium tablets in the same manner as with the light and heavy tablets. The positives, comparatives, and superlatives. Direct Refinement of the baric sense. Offer the child a blindfold, although it is optional.